"An efficient way to heat your home, and it comes at an unbeatable value." "It's a great investment for the low price." "Well worth the investment, as it performs much better than other wood stoves." "This little stove starts up easily and is perfect for heating small spaces." "Ideal for small spaces, and it's as inexpensive as they come." "It provides an impressive amount of heat and looks great in hearths." "A safer alternative to a traditional wood stove if you have young children or curious pets." "Provides all the heat you need while making a stunning focal point." For a high-quality wood stove that will heat a medium-size house and comes at a reasonable price, your best bet may be the Englander 1,800 sq. ft. Wood-Burning Stove. This freestanding stove measures in at 26” x 28.5” x 24” deep, and it can hold logs up to 18” long. Reviewers write that the Englander Wood-Burning Stove is an efficient way to heat your home, and it comes at an unbeatable value. Plus, the option to choose between legs or a pedestal is an added bonus! Wood stoves can get quite expensive, with high-end models costing over $1,000. However, you can get a quality product for a fraction of the cost if you know where to look! This 900 sq. ft. Direct Vent Wood Stove from United States Stove Company costs hundreds less than many other options, and it will still keep your home toasty warm in the winter. This rustic wood stove measures 25.75''x 21.5'' x 33'', and it can heat a space up to 900 square feet. It’s EPA certified and has a 6-hour burn time. While it doesn’t have a glass window on the front, reviewers say it’s a great investment for the low price and will look nice in any home. Big homes need a big wood stove to keep them warm. If you have a large space to heat, you need a product like the Vogelzang Ponderosa 3,200 sq. ft. Wood-Burning Stove with Blower. This unit is on the more expensive end of the spectrum, but it gets top marks from reviewers who say its performance is exceptional. This wood stove measures in at 23.75” x 32.5” x 37.75”. It can hold up to 30 pounds of logs up to 22” long and burn for up to 14 hours per fueling, heating homes as large as 3,200 square feet. The wood stove is EPA-certified and has an adjustable high-speed blower to more efficiently distribute warm air, as well as a large ash drawer for easy cleaning. It truly is a monster of a wood stove! Reviewers say the Vogelzang Ponderosa Wood-Burning Stove is well worth the investment, as it performs much better than other wood stoves, saving you energy and fuel during cold winters. Best for Small Homes: Drolet Pyropak 22 in. Wood Stove 1000 sq. ft.
On the other hand, a smaller wood stove will perform just fine if you have a smaller home or just want to heat a few rooms. The Drolet Pyropak 22 in. Wood Stove is designed for spaces up to 1,000 square feet, and you can’t beat the price on this classic unit. This wood stove is 22.6” x 27.3” x 21.8”. It can hold logs up to 17” long and has a 5-hour burn time. The pedestal model is EPA-certified, and the high-resistant ceramic glass door allows you to watch your fire crackle and burn. According to reviewers, this little stove starts up easily and is perfect for heating small spaces. Plus, it’s significantly less expensive than larger units. Looking for a compact wood stove to heat up a small garage or workshop? 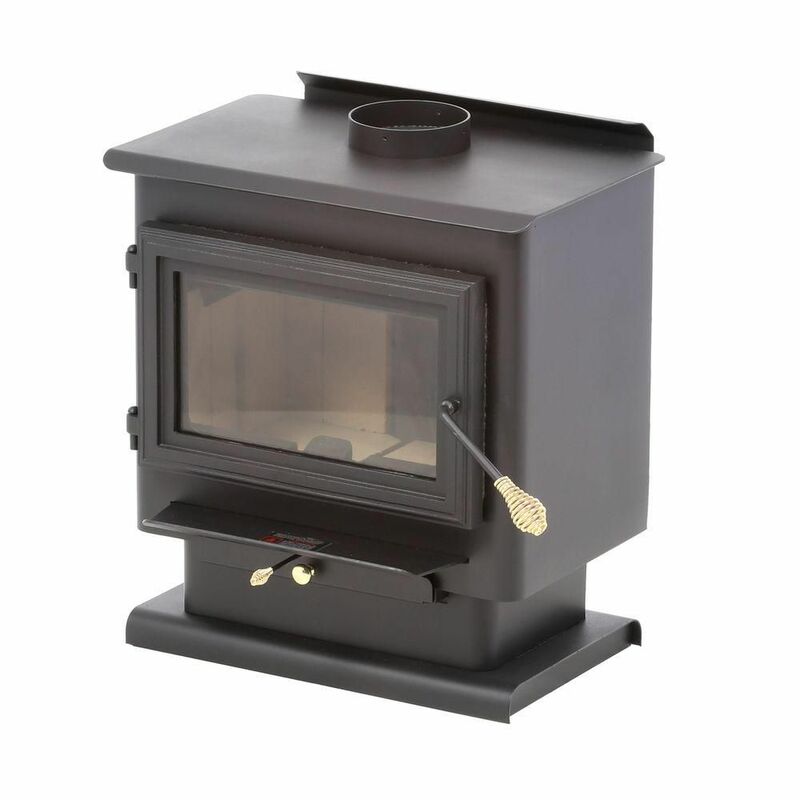 The Guide Gear Outdoor Wood Stove is the perfect product for the job. This little stove is ideal for small spaces, and it’s as inexpensive as they come. This wood-burning stove is much smaller than other units, measuring just 17.75" x 11.75" x 16.25”. It comes with five pipes and requires proper ventilation when used indoors, but reviewers say it’s a great way to heat up a small garage or shop. You can even use the top platform to keep coffee or saucepans warm. A few reviewers note that the door on this wood stove is not sealed well, so it does let some smoke out, but you can easily reinforce the seal for better performance. If you have a small living space or just don’t like the look of freestanding wood stoves, you might prefer a fireplace insert. The Englander 27.5 in. 1500 sq. ft. Wood-Burning Fireplace Insert is a top-rated product in this category, receiving glowing reviews from users who say it provides an impressive amount of heat and looks great in their hearths. This wood stove insert measures 27.5” x 21.5” x 24” deep, and it can heat spaces up to 1,500 square feet using logs up to 18” long. It features a satin black body and extra-large glass door to give you a lovely view of the fire, and it includes a blower that fits under the ash lip. 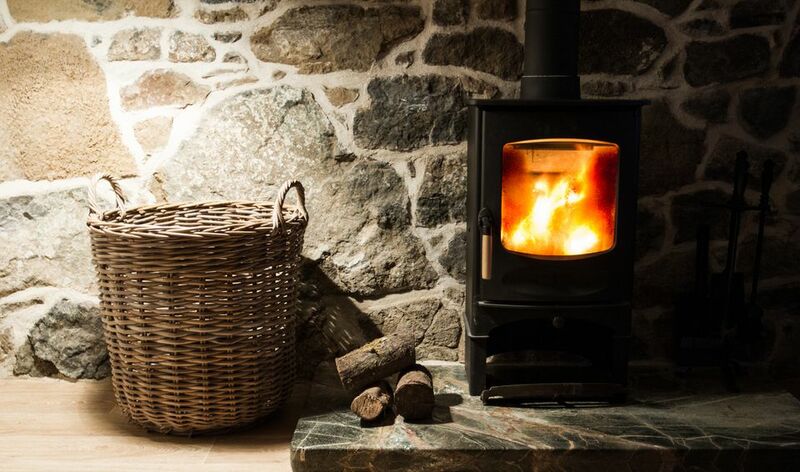 Reviewers say this wood stove insert is much more efficient at heating a room than a regular fireplace, but several do note that the blower is rather loud. Also, it’s important to note that you might need professional installation for this unit if you’re not familiar with fireplaces. Want the warmth and aesthetic of a wood stove without having to buy wood? Then you’ll love the Duraflame Infrared Quartz Fireplace Stove, an electric heater styled to resemble a wood stove. This product measures 13” x 24” x 23.4” wide, and it can heat a room up to 1,000 square feet. There are three windows that let you look into the faux stove, and you can adjust the temperature, color, brightness and speed settings to your preference. What’s great about this product is that it’s cool to the touch, so it’s a safer alternative to a traditional wood stove if you have young children or curious pets. As an added bonus, reviewers say the flames in this electric wood stove are surprisingly realistic, and the unit is a great source of supplementary heat for your house. A lot of wood stoves have a rustic design, and if that doesn’t match your home decor, you may want a more modern product, such as the Englander 1200 sq. ft. Wood-Burning Stove. This wood stove provides all the heat you need while making a stunning focal point in your modern home. This freestanding wood stove is 22” x 32” x 5.5” deep, and it can accomodate logs up to 16” long, heating spaces up to 1,200 square feet. The European-style design includes a cast iron door with hidden hinges, a sleek silhouette and a small space underneath the firebox where you can store extra wood. The unit includes a blower, as well, to help distribute air throughout your home more efficiently. Reviewers say this modern wood stove looks great and works even better, easily heating up medium sized homes.